Cuba’s President Raul Castro has made a seemingly impromptu address at a Revolution Day ceremony and said he is willing to hold talks with the US. Raul Castro, who had not spoken at the event for the past two years, grabbed the microphone to address the crowd in the eastern province of Guantanamo. The president said he would hold talks with the US, as long as it was “a conversation between equals”. The two countries have not had diplomatic relations for five decades. Raul Castro said the offer had already been made through diplomatic channels and that no topic was off limits. “Any day they want, the table is set,” Raul Castro said. He said he was prepared to discuss “the problems of democracy, human rights etc. But on equal terms because we are no-one’s colony”. 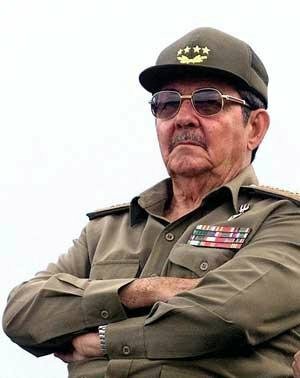 Cuba would remain independent and free, he said, and nothing like the uprisings in Libya or Syria, backed by foreign forces, would happen in the country. If the US wanted confrontation, he quipped, then it should be in baseball or some other sport. “Preferably baseball when sometimes they win, sometimes we do,” he said. Turning to internal matters, he said that social and economic reforms within Cuba would go on “little by little”. The annual ceremony marks the 59th anniversary of the failed storming of the Moncada military barracks, often considered the beginning of the revolution led by his brother Fidel Castro. Fidel Castro frequently used Revolution Day addresses to make major policy announcements. This year’s main celebration began at dawn with music and speeches. First Vice President Jose Ramon Machado Ventura said in a keynote address that Havana would continue efforts to shut down the US naval base there. “We will continue to fight such a flagrant violation… we will never stop trying to recover that piece of ground,” he said.